Govt, Opposition Meeting Ends in Deadlock? Should War-Time Crimes Be Punished? 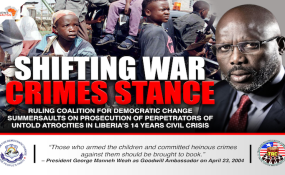 River Gee County Senator Comany B. Wesseh says Liberia is not prepared for the establishment of a War Crimes Court, in the wake of persistent debate for and against the establishment of such court here. Some Liberians believe that the establishment of a War Crimes Court to prosecute war criminals would deter any further civil hostilities as was done in the past, killing an estimated 250,000 innocent Liberians and residents. But there are those on the other side of the argument, like Senator Wesseh, who share the view that the country is not ready for such court. Giving a reflection Tuesday, 14 August on Capitol Hill, Senator Conmany Wesseh, a onetime activist during the regime of slain President Samuel Doe insisted that Liberia is not prepared economically, psychologically and stability - wise to establish the court at this time of the administration. Senator Wesseh argues that the establishment of a War Crimes Court is very costly, and the Liberian Government should be willing to finance the process and not to depend on other foreign taxpayers' monies. According to Senator Wesseh, at the first stage to establish the court, the government here should establish a special court that will gather evidences on people that need to be indicted and subsequently forwarded to the War Crimes Court for prosecution. He says this requires funding, saying the Comprehensive Peace Accord (CPA) that was signed in Accra, Ghana in 2003 required that Liberians will only use the Truth and Reconciliation method of healing the wounds created by the war. He recalls that the agreement that subsequently brought peace and total stability here did not call for the establishment of a War Crimes Court in Liberia. Senator Wesseh suggests that the government has high competing priority issues in the 2018/2019 national budget and not a War Crimes Court. He believes that the War Crimes Court is far from reality, indicating that there are some groups of people who are seeking the establishment of the Court but anticipating foreign donors' monies to be used. He, however indicated that if Liberians actually wants such a court here, the government should invest in the process. Senator Wesseh emphasizes that during the peace talk in Ghana, the Truth and Reconciliation was a compromising point. According to him, there were Liberians who were seeking War Crimes Court, while others were seeking a pardon for warlords. In the end, he recalls that those that sought the TRC process were given green light and suitable approach by all including the warring factions. Meanwhile, Senator Wesseh has proffered a bill seeking to celebrate August 18 each year as a national peace holiday and to be observed as working holiday. Upon reading the bill on the floor of the Liberian Senate during its regular session on Tuesday, the Senate's plenary amended the bill to name and style it: 'Peace and Democracy Bill'. Speaking about the submission of the bill, Senator Wesseh says considering the significance of the singular event in the history of Liberia, he has been advocating for an annual celebration of the August 18 national peace day. It was on August 18, 2003 in Accra, Ghana, when heads of warring factions, political parties and the civil society organizations signed the CPA that brought the 14 years of brutal civil conflict to an end. "For 14 years, from 1989 to 2003, our country was engulfed in a war with itself during which about 250,000 people or 7 percent of the population then died; more than one million people or about 29 percent of the population then were internally and externally displaced," he recalls. Senator Wesseh continues that nearly every family, village, town, community and city suffered physical devastation and psychological damage. He also cites social and economic infrastructure in hundreds of millions of United States dollars due to destructions here, saying Liberia was condemned to a failed state, and a beggar nation.